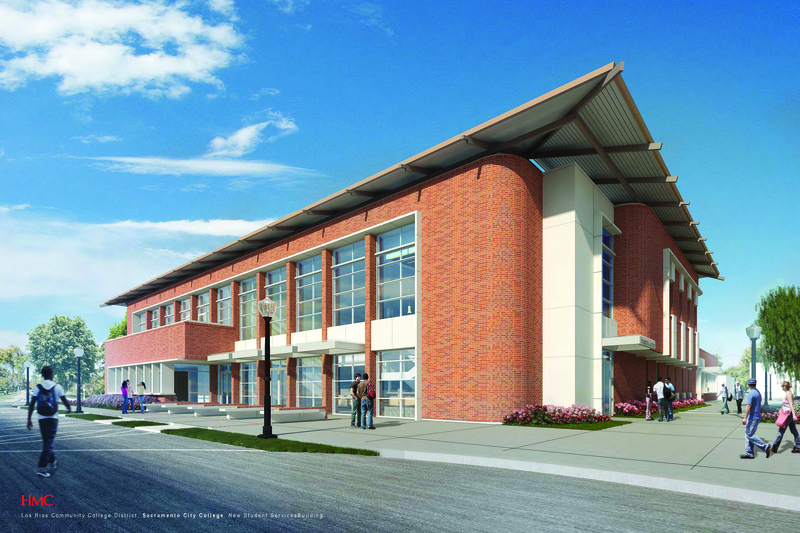 A rendering of the new Student Services building, which will replace the current Student Services and Administration of Justice building by early 2015. Image courtesy of HMC Architects. A new Student Services building is scheduled to become part of the City College campus by early 2015. According to Vice President of Administrative Services Robert Martinelli, the $8.4 million construction project will begin June 17 and last until approximately January or February 2015. The construction has been contracted to J.F. Otto, which Martinelli said is the same contractor that built the City College parking structure. The project was designed by HMC Architects in Sacramento and will begin after the demolition of the current Administration of Justice and Student Services buildings, which means that all services housed in those buildings have been or will be temporarily moved to other locations. Dean of Financial Aid and Student Services Christine Hernandez explained in an email what services will be moving and where they will be accessible during the construction period. Hernandez also elaborated on all of the student services, which will move to the first floor of the new building upon completion. Martinelli said that the Administration of Justice classes are currently being taught in classrooms at the West Sacramento Center as well as some classrooms at the main campus, which made room for DSPS during the Performing Arts Center modernization project. According to Martinelli, after the journalism department moves into the new building from Temporary 3, that building will most likely be used as laboratory space during the eventual modernization of Mohr Hall and Lillard Hall. He said there will also be a modernization phase for Rodda North’s third floor to create more classroom and office space. Martinelli said the H Lot parking lot, located between the construction site and Rodda North, will be fenced off and used for construction equipment during the project. The H Lot is dedicated to parking for people with disabilities, but Martinelli said the campus has plenty of other dedicated disability parking spaces and that Paratransit buses will have specific areas to drop off students as well. Admissions and Records Supervisor Kim Goff was a part of the planning board for the new building and said she’s excited because it will bring together a lot of services that are currently spread out on campus. Goff added that one of the main goals of the new building is to lower the number of students who get lost in the shuffle. She added that in order to make the processes smoother and faster, it’s important to help students know exactly what to do next. Photography Department Chair Paul Estabrook was also a part of the planning board. Since the upper floor of the building will combine journalism and photography, members of both departments gave input about how they’d like to see the space utilized. Estabrook said there will be several advantages to the new building, including more space, better equipment, updated seating and computer labs, but that the best part will be the building itself. Estabrook explained that the advantage of this type of studio is that photo shoots inside the building can take full advantage of the daylight, which he says will provide a lot of diverse learning opportunities. Furthermore, Estabrook explained that this type of studio won’t sacrifice other methods of photography. Overall, Goff said she’s looking forward to the new building because it will make everything easier for everyone involved and provide a welcoming entry point to taking classes at City College. This entry was posted in News, Sac City Express (SCC) and tagged Bob Martinelli, construction, journalism, Kim Goff, Paul Estabrook, photography, Sac City College, SCC, student services. Bookmark the permalink.